Roger Vignoles writes in his booklet notes that ‘to enter the world of Mahler’s Wunderhorn songs is like opening a picture book. Each page gives us another character, another fairy tale, another episode, whether happy or tragic, in the tale of human existence … such is the consistency of its musical tone that Mahler achieves a remarkably intense evocation of human life in this collection, portrayed with empathy, humour and compassion’. Some of these celebrated songs are much more familiar in their orchestral versions and pose a great challenge to the pianist. However the piano’s capacity for quasi-orchestral sonorities and textures was an essential element in the evolution of the Lied as an art form, allowing as it did for a far wider range of symbolic reference than would have been possible with any other accompanying instrument, and Roger Vignoles achieves a great level of intimacy within this framework. Gustav Mahler once famously remarked of his symphonies (to Sibelius, in 1907) that they were meant to be ‘like the world … all-embracing’. But as we noted in the essay accompanying the previous CD of Mahler songs (CDA67392), it was from a very particular world that he drew the inspiration for his first four symphonies. Des Knaben Wunderhorn (‘The Youth’s Magic Horn’) was the title given to a vast collection of German folk verses gathered by the poets Achim von Arnim (1781–1831) and Clemens von Brentano (1778– 1842) during their journeys on the Rhine and its tributaries. First published in 1805 in Heidelberg (at that time the literary centre of the Romantic movement in Germany), with a larger edition appearing in 1808, the collection represented (among other things) a conscious effort to counterbalance what was seen as the unhealthy, even dangerous influence of the Age of Enlightenment, especially as represented by French culture and the dire upheavals of the Revolution and Napoleonic wars. On the literary side, writers like Johann Gottfried Herder (1744– 1803) argued for the superiority of Naturpoesie (the poetry of Nature) over Kunstpoesie (the poetry of Art—for which read all things Rational and French), while at the political level it was hoped that a return to the roots of German culture would speed up the goal of German unification. Reviewing Des Knaben Wunderhorn in 1807, Goethe remarked teasingly that every household in the land should keep a copy on the shelf with its cookery books and bibles, or better still on the piano, where its contents could be sung to suitably simple melodies and accompaniments. In the event, the Naturpoesie of the Wunderhorn songs came to be associated with a Kunstpoesie of a less humble kind. From its very beginnings the German Lied had made use of poetry either of folk origin, or closely based on folk song. So it is no surprise to find Wunderhorn texts among the songs of Schumann, Mendelssohn, Brahms and Strauss. But in general such poems were chosen as light relief—examples of genre painting, so to speak, to offset the more serious masterpieces. It was only Mahler who actually absorbed the implied music of the poems into his own musical language, and this he did first in the songs and then in the vast symphonic movements which he derived from them. For this purpose they were the perfect raw material, combining the earthy and the fantastic, the individual and the universal. 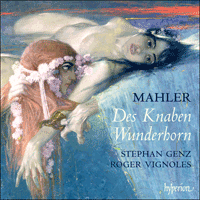 In all, Mahler composed some two dozen Wunderhorn songs with orchestral accompaniment (twelve, composed between 1892 and 1901, were published under the title Humoresken). In all but two cases the orchestral songs were preceded by piano versions, which, while clearly conceived in orchestral terms, are emphatically not ‘piano reductions’ (in the manner of an operatic vocal score, for example) but independent versions in their own right. The exceptions are Revelge and Der Tamboursg’sell, the two great military pieces with which this CD begins and effectively ends (Urlicht acting in this case as a coda). Both of these songs were composed at a later date than the rest of the collection, and the evidence suggests both that their composition was far more closely bound up with their symphonic parallels, and that each was composed directly in full score. Realizing them on the piano, therefore, requires a degree of creative interpretation, especially in Revelge with its huge battery of trumpet and drum effects. But for the pianist, tackling any of these songs is a challenge, inviting as it does comparison with the more frequently performed orchestral versions. Yet, as we noted before, the piano’s capacity for quasi-orchestral sonorities and textures was an essential element in the evolution of the Lied as an art form, allowing as it did for a far wider range of symbolic reference than would have been possible with any other accompanying instrument. Many of Schubert’s greatest songs depend on quasi-orchestral piano parts for their effect, while Hugo Wolf derived his own musical language from a pianistic recreation of Wagner’s ‘symphonic web’. So, Mahler may have always had an orchestral destination in mind, but he was by no means alone among Lieder composers in conceiving his piano parts in orchestral terms. To enter the world of Mahler’s Wunderhorn songs is like opening a picture book. Each page gives us another character, another fairy tale, another episode, whether happy or tragic, in the tale of human existence. Admittedly the characters, as in most folk song, are drawn from a relatively limited range of society. Military marches and Ländler abound, so that everyone seems to be either in uniform or wearing a Dirndl. Yet in spite of, or perhaps even because of, this relatively enclosed frame of reference, such is the consistency of its musical tone that Mahler achieves a remarkably intense evocation of human life in this collection, portrayed with empathy, humour and compassion. On the military side, it is clear where his sympathies lie. His soldiers are no heroes, no changers of the world; they are the poor bloody infantry, the cannon-fodder (Revelge), the shell-shocked boys due to be shot or hanged at dawn pour encourager les autres (Der Tamboursg’sell). And his girls are their lovers, taking them to their beds for a farewell tryst before losing them to the war (Wo die schönen Trompeten blasen), distracting them on sentry-go (Der Schildwache Nachtlied), or teasing them for their arrogant carrying-on in their smart uniforms (Trost im Unglück). In the background to these trysts and tiffs is the rural life with its mowers and servant-girls (Rheinlegendchen), its country bumpkins and peasant-girls (Verlorne Müh), its grinding poverty (Das irdische Leben) and its folk humour laced with homespun wisdom (Lob des hohen Verstandes, Des Antonius von Padua Fischpredigt). The current recording begins with one of the two latest-composed and longest songs of the collection. Revelge (1) is a terrifying march of death, from the days when troops went into battle as though on parade. To the rattle of drums and blare of trumpets, it is propelled headlong from early morning reveille into the fury of charge and countercharge. Only when every man has been mown down does the pace slacken, transforming the smart military stride into the dry rattle of dead men’s bones, ghostly fanfares echoing across the stricken landscape. The final page, in which the dead drummer and his comrades rise up once more on parade, is cataclysmic in its effect. By contrast, Lob des hohen Verstandes (2) is one of the comic gems of the set. In one of his earlier Wunderhorn songs, Ablösung im Sommer, Mahler had humorously portrayed the transfer of vocal responsibility from cuckoo to nightingale with the passing of spring into summer. In Lob des hohen Verstandes the two avian songsters are in direct competition, and the chirpy C major is surely intended to suggest the pomposity of an ornithological Meistersinger. Academic scales and trilling cadences, the airy piping of the birds and the bucking and braying of the donkey, comic repetitions (‘Ohren groß, Ohren groß’) and throat-clearing pauses all contribute to the general air of naïve humour. At the end the donkey delivers his judgement with the fatuous lack of self-doubt of the truly stupid. Rheinlegendchen (3) is the most charming and delightful of the many Ländler among the Wunderhorn songs, so successful at its first performance that the audience demanded an encore. In addition to the inevitable harmonization in thirds and sixths, the piano interludes incorporate elements of folk-fiddle improvisation. An inspired descent to the subdominant, as the mower’s ring sinks into the waters of the Rhine, is the most graphic of a number of startling key-shifts in this otherwise apparently simple song. In concert, the Wunderhorn songs are often performed by two singers, male and female, and the collection includes a number of dialogues, of which the most famous, Wo die schönen Trompeten blasen (5), is perhaps the emotional highpoint of the whole set. It has a direct ancestor in Kriegers Ahnung, one of the most compelling songs of Schubert’s Schwanengesang. Offstage military fanfares and drum beats set the scene, in which a girl is visited by her lover, or by his spirit, on the eve of battle. Whether he is already dead, or has a premonition of death next day, is not absolutely clear, but in either case the rapt tenderness of the encounter, and its foreboding, is unmistakeable, contrasting the tight-laced 2/4 of military duty with the lilting, dreamlike 3/4 of the lovers’ embrace. A similar conflict between duty and personal emotion is the subject of two further colloquies, which frame Wo die schönen Trompeten blasen on this recording, again musically realized in the contrast of military duple with seductive triple time. In Lied des Verfolgten im Turm (4), to the refrain of ‘Die Gedanken sind frei’, a political prisoner steadfastly maintains his courage against the pleas of his beloved. At first there is a complete contrast between his music and hers, suggesting she has no comprehension of the high ideals that have landed him in prison in the first place. But as she becomes more desperate and he more obdurate, elements of her complaints begin to infect his music. Nevertheless the song ends with his reiterating the refrain—‘Thoughts are free’. More haunting in its atmosphere is Der Schildwache Nachtlied (6). Here it is a soldier on sentry-go who has to resist the blandishments of an alluring female. With increasing vehemence (and even military bravado) he proclaims his devotion to duty, but the allure of her voice continues to ring in his (and our) ears through the extraordinary harmonies and textures in which Mahler clothes the final bars of the song. Das irdische Leben (7) has a form typical of many folk-song traditions in which a sequence of actions leads to an inevitable, and usually unwelcome conclusion. In this case a mother is trying to comfort her starving child. Three times she attempts to quieten him—‘tomorrow we will harvest/thresh/bake’—but by the end it is too late to save him. Mahler sets the two voices against an eerie E flat minor moto perpetuo which suggests the grinding of the mills of fate. The child’s repeated cries of ‘Gib mir Brot’ span the widest possible intervals, first an octave then a tenth, like the gaping mouth of a fledgling in the nest, while the mother’s attempts at reassurance, lower in pitch, betray both anxiety and impotence. In the long interlude before the final couplet the music almost comes to a halt, its uneasy stasis telling us the outcome even before it is spelled out to us. Des Antonius von Padua Fischpredigt (8), which Mahler later developed into the scherzo of his Symphony No 2, is the musical equivalent of a scene from some medieval German altarpiece. In this tale St Anthony, fed up at the indifference of his congregation, goes down to the river to preach to the fishes, the joke (and the moral) being that however much they all enjoy the sermon they are no more reformed by it than their human equivalents. Mahler’s setting has a wonderfully straight-faced sense of humour, its 3/8 ostinato teeming with fish that dart and dive through the depths of the keyboard in gleaming parallel thirds. When the fishes’ delight is expressed (‘Kein Predigt niemalen …’) the underlying Ländler becomes an outright dance, strutting its stuff with an almost Bergian polytonality, while a smoother and nobler F major section at ‘Gut Aale und Hausen’ perfectly conveys the distinctions of rank. At the end however all is disillusion; the final verse is underpinned by a C minor pedal point and the scene dissolves in a descending chromatic passage that is remarkably similar to the end of Das ist ein Flöten und Geigen from Schumann’s Dichterliebe. Wer hat dies Liedlein erdacht? (9) is another moto perpetuo in 38 time, its yodelling semiquavers obviously deriving from its Alpine context (‘High in the mountain …’). Evidently not meant to be taken seriously, the mock-pathos of the middle section (‘Mein Herzle ist wund’) is underlined by Schubertian key-shifts to G major and C flat major, while the final page is enlivened by no fewer than seven consecutive top E flats on the line ‘Und wer das Liedlein nicht singen kann’. Two comic dialogues follow. Trost im Unglück (10) is a truculent exchange between a hussar and his paramour. Noisily proclaiming their self-sufficiency (she mocking his hobby-horse canter with a steadier, sidelong rhythm of her own), they gallop off in opposite directions, only to meet up next day, one suspects, for another round. Verlorne Müh (11) is a more unequal contest. Here the music is outright caricature, the girl’s wheedling Ländler-rhythms and lachrymose grace notes becoming ever more extreme, and the boy’s brushoff increasingly peremptory. But remove just a little of the acid, and the song could have come straight from the pen of Johann Strauss. There is, however, no mistaking the composer of Der Tamboursg’sell (12). Like its companion-piece Revelge it is constructed on a far bigger scale than the other songs, as much inspired by, as generative of, the great Trauermarsch of the fifth symphony, which it closely resembles. As we have seen it was also composed some years later than the other Wunderhorn songs, at a time when Mahler was moving towards the other great literary influence on his composition, Friedrich Rückert. For the whole first part its texture is unremittingly spare and bleak, consisting of little more than a dirge-like groan and a riffle of drums. But the interlude that follows gives birth to a wholly unexpected and deeply moving melody, as the doomed drummer bids farewell to the world. Such a valedictory lament is of course not without precedent in Mahler’s songs—the last song of Lieder eines fahrenden Gesellen, for instance, is a funeral march, and the early song Zu Straßburg auf der Schanz also tells of a young soldier condemned to hang. But this passage has a greater significance in the development of Mahler’s compositional style. As the Mahler scholar Donald Mitchell has perceptively noted, the long drawn out melody, with its canonic second voice, sustained over a simple tonic–dominant bass, bears more than a passing resemblance to part of the first song of Kindertotenlieder, Nun will die Sonn’ so hell aufgehn. So this song, composed at the very cusp of Mahler’s transition from Wunderhorn to Rückert mode, manages to combine elements of both. It was Mahler’s own farewell to the world of Des Knaben Wunderhorn. Urlicht (13), which acts as a coda to this recording, is the most remarkably spiritual song of the set. Recycled a year after its composition as the fourth movement of the second symphony, it is deceptive in its simplicity. The extraordinary serenity of the chorale-like section, for instance, is the product of a constantly changing time signature that punctuates the phrases and allows pauses for reflection. Both earthly sorrow and heavenly bliss are sketched in with vivid economy, the singer’s ‘broad path’ signalled by birdsong in the manner of Ich ging mit Lust—a vision of heaven as a paradise of nature, while the impassioned tremolandi and yearning intervals of the climax expand a mere five minutes of music into an entire treatise on the human condition. Nothing could better illustrate the crucial importance of the Wunderhorn world to Mahler’s vision—musical, emotional and spiritual. Un jour de 1907 qu’il évoquait ses symphonies avec Sibelius, Gustav Mahler eut ces mots fameux: elles doivent être «comme le monde … [et] tout embrasser». Mais, comme nous l’avons vu dans la présentation du précédent volume de ses lieder (CDA67392), ses quatre premières symphonies furent inspirées par un univers très particulier. Des Knaben Wunderhorn («Le cor merveilleux de l’enfant»): ainsi les poètes Achim von Arnim (1781–1831) et Clemens von Brentano (1778–1842) intitulèrent-ils un vaste recueil de poésies populaires allemandes réunies durant leurs voyages sur le Rhin et ses affluents. Publiée pour la première fois en 1805 à Heidelberg (alors capitale littéraire du mouvement romantique allemand)—une édition augmentée parut en 1808—, cette anthologie incarnait, entre autres, un effort délibéré pour contrecarrer ce qui était perçu comme l’influence malsaine, voire dangereuse, du Siècle des lumières, surtout symbolisé par la culture française et par les terribles bouleversements de la Révolution et des guerres napoléoniennes. Sur le plan littéraire, des auteurs comme Johann Gottfried Herder (1744–1803) avancèrent le primat de la Naturpoesie (la poésie de la Nature) sur la Kunstpoesie (la poésie de l’Art—entendez par là tout ce qui touche au rationalisme et à la France), cependant que, politiquement, on espérait qu’un retour aux racines de la culture germanique accélérerait l’unification de l’Allemagne. Dans son compte rendu de Des Knaben Wunderhorn, en 1807, Goethe suggéra, en plaisantant, que chaque foyer devrait en garder un exemplaire entre les livres de cuisine et les bibles ou, mieux encore, sur le piano, son contenu pouvant être chanté sur des mélodies et des accompagnements assez simples. En fin de compte, la Naturpoesie des lieder du Wunderhorn se trouva associée à une Kunstpoesie d’un genre moins humble. Dès ses balbutiements, le lied allemand avait utilisé de la poésie soit populaire, soit étroitement fondée sur des chansons populaires. Aussi n’est-il pas étonnant de découvrir des textes du Wunderhorn parmi les lieder de Schumann, Mendelssohn, Brahms et Strauss. En général, cependant, ces poèmes furent choisis pour détendre l’atmosphère—des peintures de genre, en quelque sorte, destinées à contrebalancer les chefs-d’œuvre plus sérieux. En fait, Mahler fut le seul à assimiler la musique implicite de ces poèmes dans son propre langage musical, et il le fit d’abord dans ses lieder, puis dans les vastes mouvements symphoniques qu’il en tira. Et ils constituèrent une matière première idéale, mêlant le matériel et le fantastique, l’individuel et l’universel. En tout, Mahler composa deux douzaines de lieder sur des textes du Wunderhorn, dont la moitié (composés entre 1892 et 1901) parurent en versions orchestrales sous le titre de Humoresken. Sauf dans deux cas, ces lieder orchestraux furent précédés de versions avec piano qui, pour être à l’évidence pensées en termes orchestraux, ne sont en rien des «réductions pour piano» (à la manière des partitions vocales opératiques, par exemple), mais bien des versions totalement indépendantes. Les deux exceptions sont Revelge et Der Tamboursg’sell, les grandes pièces militaires qui inaugurent et closent avec beaucoup d’effet ce disque (Urlicht faisant alors office de coda). Ces deux lieder furent postérieurs au reste du corpus, certaines preuves suggérant et une composition bien plus étroitement liée à leurs pendants symphoniques, et une écriture directement sous forme de grande partition. Les jouer au piano exige donc pas mal d’interprétation créative, surtout en ce qui concerne Revelge, avec sa colossale batterie de trompette et ses effets de tambour. Mais, pour le pianiste, chacun de ces lieder est un véritable défi, car il appelle la comparaison avec les versions orchestrales plus souvent jouées. Pourtant, nous l’avons vu, le piano—par sa capacité à produire des sonorités et des textures quasi orchestrales autorisant un éventail de références symboliques bien plus large que ne l’eût fait tout autre instrument accompagnateur—fut un élément déterminant qui permit au lied de devenir un moyen d’expression artistique. Nombre des plus grands lieder schubertiens assoient leur effet sur des parties de piano quasi orchestrales, tandis qu’Hugo Wolf tira son propre langage musical d’une recréation pianistique du «tissu symphonique» wagnérien. Mahler, s’il a peut-être toujours eu en tête une visée orchestrale, ne fut donc pas le seul compositeur de lieder à penser ses parties de piano en termes orchestraux. Pénétrer dans l’univers du Wunderhorn mahlérien, c’est comme ouvrir un livre d’images avec, à chaque page, un nouveau personnage, un nouveau conte de fées, un nouvel épisode, heureux ou tragique, de l’histoire de l’existence humaine. Comme dans la plupart des chansons populaires, les personnages appartiennent, avouons-le, à une frange de la société relativement restreinte: les marches militaires et les Ländler abondent, au point que tout le monde semble être en uniforme ou en Dirndl [NdT: style vestimentaire calqué sur celui des paysannes des Alpes]. Pourtant, en dépit—ou peut-être à cause—de ces références relativement limitées, la cohérence de la couleur musicale est telle que Mahler réussit ici une évocation de la vie humaine remarquablement intense, brossée avec empathie, humour et compassion. S’agissant de la chose militaire, on voit bien où vont ses sympathies. Ses soldats ne sont pas des héros, ils ne changent pas le monde: c’est la pauvre infanterie ensanglantée, la chair à canon (Revelge), les commotionnés de guerre qu’on doit fusiller ou pendre à l’aube pour encourager les autres (Der Tamboursg’sell). Quant à ses jeunes filles, elles sont leurs amantes, celles qui les entraînent dans leur lit pour un rendez-vous galant en forme d’adieu, avant de les perdre à la guerre (Wo die schönen Trompeten blasen), celles qui les détournent de leur faction (Der Schildwache Nachtlied) ou qui brocardent leurs manières arrogantes, dans leurs uniformes chic (Trost im Unglück). En toile de fond à ces rendez-vous galants et à ces bisbilles, il y a la vie rurale avec ses faucheurs et ses servantes (Rheinlegendchen), ses péquenauds et ses paysannes (Verlorne Müh), sa misère écrasante (Das irdische Leben) et son humour populaire mâtiné de sagesse plébéienne (Lob des hohen Verstandes, Des Antonius von Padua Fischpredigt). Le présent enregistrement s’ouvre sur l’un des lieder les plus tardifs et les plus longs du recueil: Revelge (1), terrifiante marche de la mort, du temps où les troupes s’en allaient au combat comme à la parade. Au bruit des tambours et à la sonnerie des trompettes, ce lied est précipité la tête la première du réveil, tôt le matin, à la furie de la charge et de la contre-attaque. Et c’est seulement lorsque tous les hommes ont été fauchés que l’allure ralentit, métamorphosant la vive cadence militaire en un fracas sec, celui des os des trépassés, tandis que de spectrales fanfares retentissent à travers le paysage dévasté. La page finale, où le tambour mort se relève, avec tous ses camarades, pour la parade, est d’un effet cataclysmique. Par contraste, Lob des hohen Verstandes (2) est l’un des bijoux comiques du corpus. Dans Ablösung im Sommer, autre lied wunderhornien, Mahler avait déjà évoqué avec humour la passation de l’autorité vocale entre le coucou et le rossignol, au tournant du printemps et de l’été. Dans Lob des hohen Verstandes, les deux oiseaux chanteurs sont en compétition directe, et le guilleret ut majeur est sûrement là pour suggérer les manières pompeuses d’un Meistersinger avien. Les gammes académiques et les cadences qui trillent, l’insouciant gazouillis des oiseaux, les ruades et le braiement de l’âne, le comique des répétitions («Ohren groß, Ohren groß») et les pauses pour s’éclaircir la voix, tout cela concourt à l’humour naïf de cette pièce. À la fin, l’âne rend son verdict, avec cette béate absence de doute propre aux vrais idiots. De tous les Ländler des lieder wunderhorniens, Rheinlegendchen (3) est le plus charmant, le plus avenant, celui dont la création fut un tel succès que le public le bissa. Outre l’inévitable harmonisation en tierces et en sixtes, les interludes pianistiques intègrent des éléments d’improvisation au violon rustique. Une descente inspirée à la sous-dominante, lorsque l’anneau de la faucheuse disparaît dans les eaux du Rhin, est la plus imagée de toutes les éblouissantes transitions tonales de ce lied qui semble, par ailleurs, simple. En concert, les lieder du Wunderhorn sont souvent chantés par un homme et une femme, et le recueil contient plusieurs dialogues, le plus célèbre, Wo die schönen Trompeten blasen (5), marquant peut-être l’apogée émotionnel du corpus. Son ancêtre direct, Kriegers Ahnung, compte parmi les lieder les plus envoûtants du Schwanengesang schubertien. En coulisses, fanfares militaires et battements de tambour plantent le décor: à la veille d’une bataille, une jeune fille est visitée par son amant, ou par l’esprit de celui-ci. On ne sait au juste s’il est déjà mort ou s’il pressent la mort qui le frappera le lendemain; toujours est-il que la tendresse ravie de la rencontre, son caractère prémonitoire aussi, sont indéniables, qu’illustre le contraste entre le 2/4 bien serré du devoir militaire et le 3/4 souple, langoureux, de l’étreinte des amants. Le même conflit devoir/émotion personnelle est au cœur des deux conversations flanquant, ici, Wo die schönen Trompeten blasen avec, de nouveau, une réalisation musicale fondée sur l’antagonisme entre le binaire militaire et le ternaire séducteur. Dans Lied des Verfolgten im Turm (4), sur le refrain de «Die Gedanken sind frei», nous découvrons un prisonnier politique dont le courage ne fléchit pas devant les suppliques de sa bien-aimée. Une totale opposition entre les musiques des deux protagonistes fait d’abord penser que la demoiselle ne comprend pas les nobles idéaux qui ont conduit le jeune homme en prison. Mais à mesure que la jeune fille s’enferre dans le désespoir et le garçon dans l’inflexibilité, des éléments de ses plaintes à elle contaminent peu à peu sa musique à lui. Le lied ne s’en achève pas moins par une réitération du refrain du jeune homme—«Les pensées sont libres». Der Schildwache Nachtlied (6) nous plonge dans une atmosphère plus obsédante. Ici, c’est un factionnaire qui doit résister aux blandices d’une femme séduisante. Avec une véhémence (voire avec une bravade toute militaire) grandissante, il clame son dévouement au devoir, mais l’attrait de la voix féminine continue de résonner à ses oreilles (et aux nôtres), dans les extraordinaires harmonies et textures dont Mahler pare les dernières mesures de son lied. Dans sa forme, Das irdische Leben (7) est typique de maintes traditions de chansons populaires, où une séquence d’actions mène à une conclusion inéluctable, et souvent fâcheuse. Dans le cas présent, une mère essaie de réconforter son enfant qui meurt de faim. Par trois fois, elle tente de l’apaiser—«demain, nous moissonnerons, nous battrons le grain, nous ferons du pain»—, mais il est finalement trop tard pour le sauver. Mahler met en musique ces deux voix contre un sinistre moto perpetuo en mi bémol mineur, évocation du grincement des meules du destin. Les cris répétés de l’enfant («Gib mir Brot») couvrent les plus larges intervalles possibles, d’abord une octave puis une dixième, tel le bec grand ouvert d’un oisillon au nid, tandis que les efforts maternels pour le rassurer, à une hauteur de son inférieure, trahissent l’angoisse et l’impuissance. Juste avant le couplet final, un long interlude survient, où la musique s’arrête presque en une stagnation malcommode qui nous dévoile le dénouement avant même qu’il ne nous soit révélé en détail. Des Antonius von Padua Fischpredigt (8), que Mahler étoffera jusqu’à en faire le scherzo de sa Symphonie no 2, est le pendant musical d’une scène de retable médiéval allemand. Dans ce conte, saint Antoine, exaspéré par l’indifférence de sa congrégation, descend à la rivière prêcher les poissons, la drôlerie (et la morale) venant de ce que ces derniers, tout en appréciant beaucoup le sermon, ne s’en trouvent pas plus amendés que leurs homologues humains. La mise en musique mahlérienne a un sens de l’humour merveilleusement impassible, son ostinato à 3/8 grouillant de poissons qui s’élancent et plongent dans les profondeurs du clavier en d’étincelantes tierces parallèles. Une fois le ravissement des poissons exprimé («Kein Predigt niemalen …»), le Ländler sous-jacent devient une pure danse, qui se donne en spectacle avec une polytonalité quasi bergienne, tandis qu’une section en fa majeur, plus douce et plus majestueuse, véhicule parfaitement le rang de chacun (à «Gut Aale und Hausen»). Mais à la fin, la désillusion l’emporte: le dernier vers est étayé par une pédale d’ut mineur et la scène s’évapore en un passage chromatique descendant, remarquablement similaire à la conclusion de Das ist ein Flöten und Geigen de la Dichterliebe schumannienne. Wer hat dies Liedlein erdacht? (9) est également un moto perpetuo à 38 dont les doubles croches iodlantes sont à l’évidence d’inspiration alpine («Là-haut sur la montagne …»). Des transitions tonales schubertiennes vers sol majeur et ut bémol majeur soulignent le pseudo-pathos de la section centrale («Mein Herzle ist wund»), qu’il ne faut manifestement pas prendre au sérieux, cependant que pas moins de sept mi bémols aigus consécutifs enjolivent la page finale au vers «Und wer das Liedlein nicht singen kann». Viennent ensuite deux dialogues comiques. Trost im Unglück (10) est un truculent échange entre un hussard et sa maîtresse. Proclamant bruyamment leur indépendance (elle raille son petit galop de cheval de bois en usant d’un rythme plus régulier, latéral), ils s’en vont au galop, chacun dans une direction, mais pour mieux se retrouver le lendemain et, soupçonne-t-on, repartir pour un tour. Verlorne Müh (11) nous propose une compétition plus inégale. Ici, la musique est pure caricature: les rythmes de Ländler enjôleurs et les petites notes larmoyantes de la jeune fille se font toujours plus extrêmes et la rebuffade du garçon est toujours plus péremptoire. Pourtant, avec un soupçon d’acide en moins, ce lied eût pu jaillir de la plume de Johann Strauss. Avec Der Tamboursg’sell (12), en revanche, aucun risque de se tromper de compositeur. Comme son pendant Revelge, il est construit à bien plus vaste échelle que les autres lieder et ressemble beaucoup à l’imposante Trauermarsch de la Symphonie no 5, qu’il inspira autant qu’elle l’inspira. Comme nous l’avons vu, il fut composé quelques années après les autres lieder du Wunderhorn, à une époque où Mahler se tournait vers la seconde grande figure littéraire qui allait l’influencer: Friedrich Rückert. Pendant toute la première partie, la texture, implacablement clairsemée et austère, s’en tient à un petit grondement lugubre et à un frémissement de tambour. Mais l’interlude qui suit engendre une mélodie des plus inattendues, profondément émouvante, alors que le malheureux tambour fait ses adieux au monde. Certes, ce genre de lamentation n’est pas sans précédent dans les lieder mahlériens: le dernier des Lieder eines fahrenden Gesellen est ainsi une marche funèbre et le lied de jeunesse Zu Straßburg auf der Schanz raconte l’histoire d’un jeune soldat condamné à la pendaison. Mais ce passage joua un rôle fondamental dans le développement du style compositionnel de Mahler. Comme l’a judicieusement noté le spécialiste de Mahler, Donald Mitchell, la longue et traînante mélodie, avec sa seconde voix canonique tenue sur une simple basse de tonique–dominante, affiche plus qu’une ressemblance furtive avec une partie du premier des Kindertotenlieder, Nun will die Sonn’ so hell aufgehn. Aussi ce lied, écrit au moment clé où Mahler passait du Wunderhorn à sa phase rückertienne, parvient-il à combiner un peu des deux influences, tout en marquant l’adieu du compositeur à l’univers de Des Knaben Wunderhorn. Urlicht (13), qui sert de coda à cet enregistrement, est le lied le plus remarquablement spirituel du corpus. Recyclé un an après avoir été composé pour servir de quatrième mouvement à la Symphonie no 2, il est d’une simplicité trompeuse. L’extraordinaire sérénité de sa section de type choral, par exemple, est le fruit d’un signe de la mesure constamment changeant, qui ponctue les phrases et ménage des pauses pour la réflexion. L’affliction terrestre et la félicité céleste sont esquissées avec une parcimonie vibrante, le «large chemin» du chanteur étant balisé par un chant d’oiseau comme dans Ich ging mit Lust—le ciel est vu comme un paradis de la nature, tandis que les tremolandi passionnés et les intervalles ardents du climax font de ces cinq minutes de musique toutes simples un véritable traité sur la condition humaine. Rien ne saurait mieux illustrer l’importance cruciale de l’univers du Wunderhorn dans la vision musicale, émotionnelle et spirituelle de Mahler. Gustav Mahler machte (1907 zu Sibelius) einmal die berühmte Bemerkung: „Die Symphonie muss wie die Welt sein. Sie muss alles umfassen.“ Aber wie wir im Essay zur früheren CD von Mahler-Liedern (CDA67392) bemerkten, war es eine ganz besondere Welt, aus der er Inspiration für seine ersten vier Symphonien schöpfte. Des Knaben Wunderhorn war der Titel einer enormen Sammlung deutscher Volksdichtung, die die Dichter Achim von Arnim (1781–1831) und Clemens von Brentano (1778–1842) auf ihren Reisen am Rhein und seinen Nebenflüssen gesammelt hatten. Die Sammlung wurde 1805 in Heidelberg (damals das literarische Zentrum der romantischen Bewegung in Deutschland) zum ersten Mal veröffentlicht, und 1808 erschien eine größere Ausgabe; diese Sammlung stellte (unter Anderem) eine bewusste Bemühung dar, ein Gegengewicht zum als ungesund und sogar gefährlichen Einfluss des Zeitalters der Aufklärung zu bieten, besonders wie sie durch die französische Kultur und den Aufruhr der Revolution und napoleonischen Kriege repräsentiert wurde. Auf literarischem Gebiet argumentierten Autoren wie Johann Gottfried Herder (1744–1803) für die Überlegenheit der Naturpoesie über die Kunstpoesie (die man als alles Rationale und Französische verstehen sollte), während auf politischer Ebene Hoffnung bestand, dass eine Rückkehr zu den Wurzeln der deutschen Kultur schneller das Ziel der Deutschen Einigung erreichen ließe. In einer Rezension von 1807 bemerkte Goethe scherzhaft, dass jeder Haushalt im Lande ein Exemplar von Des Knaben Wunderhorn mit den Kochbüchern und der Bibel auf dem Regal in der Küche oder besser noch auf dem Klavier haben sollte, wo der Inhalt auf angemessen simple Melodien und Begleitung gesungen werden sollte. Die Naturpoesie der Wunderhorn-Lieder wurde schließlich mit einer Art bescheidenerer Kunstpoesie assoziiert. Von Anfang an hatte das deutsche Lied Dichtung verwendet, die entweder Volksursprung hatte oder sich nahe an das Volkslied hielt. Es überrascht also nicht, dass wir in den Liedern von Schumann, Mendelssohn, Brahms und Strauss Wunderhorn-Texte finden. Im Allgemeinen wurden solche Gedichte jedoch gewählt, um eine leichtere Note anzuschlagen—sozusagen Beispiele für Genrebilder, die ein Gegengewicht zu den seriöseren Meisterstücken bieten. Nur Mahler absorbierte die implizite Musik der Dichtung in seine eigene Musiksprache; zunächst in den Liedern und dann in den gewaltigen symphonischen Sätzen, die er aus ihnen entwickelte. Sie waren das perfekte Rohmaterial für diesen Zweck, da sie Bodenständiges und Phantastisches, Individuelles und Universelles vereinen. Insgesamt komponierte Mahler zwei Dutzend Wunderhorn-Lieder, von denen zwölf, die zwischen 1892 und 1901 komponiert wurden, unter dem Titel Humoresken in Orchesterfassungen erschienen. In allen außer zwei Fällen gingen den Orchesterliedern Klavierfassungen voraus, die, wenn auch deutlich orchestral konzipiert, absolut keine „Klavierauszüge“ (wie etwa der einer Oper), sondern selbst eigenständige Stücke sind. Ausnahmen davon sind Revelge und Der Tamboursg’sell, die beiden großen Militärstücke, mit denen diese CD beginnt und effektiv schließt (Urlicht übernimmt hier die Funktion einer Coda). Beide Lieder wurden später komponiert als die übrige Sammlung, und es gibt Hinweise darauf, dass ihre Komposition wesentlich enger mit ihren symphonischen Parallelen verknüpft ist und beide direkt in Partiturform geschrieben wurden. Sie auf dem Klavier zum Leben zu erwecken, erfordert einen gewissen Grad kreativer Interpretation, besonders in Revelge mit seiner gewaltigen Akkumulation von Trompeten- und Tommeleffekten. Für den Pianisten stellt jedes dieser Lieder eine Herausforderung, da der Vergleich mit den häufiger aufgeführten Orchesterfassungen auf der Hand liegt. Doch, wie bereits erwähnt, war die Kapazität des Klaviers für quasi orchestrale Klänge und Strukturen ein wesentliches Element in der Entwicklung des Liedes als Kunstform, da es eine weitere Bandbreite symbolischer Anspielungen ermöglicht als alle anderen Begleitinstrumente. Viele der größten Lieder Schuberts verlassen sich für ihre Wirkung auf quasi orchestrale Klavierstimmen, während Hugo Wolf seine eigene Musiksprache aus einer pianistischen Umdeutung von Wagners symphonischen Gewebe ableitete. Mahler mag also letztendlich immer das Orchester im Sinn gehabt haben, aber er war nicht der einzige Liederkomponist, der seine Klavierstimmen „orchestral“ konzipierte. In die Welt der Wunderhorn-Lieder Mahlers einzutreten, ist als ob man ein Bilderbuch öffnet. Jede Seite gibt uns einen anderen Charakter, ein neues Märchen, eine neue Episode, egal ob fröhlich oder tragisch, in der Geschichte des menschlichen Daseins. Zugegeben, die Charaktere stammen wie in den meisten Volksliedern aus einer begrenzten Bandbreite der Gesellschaft. Militärmärsche und Ländler finden sich im Überfluss, und alle Personen scheinen entweder Uniform oder Dirndl zu tragen. Und trotz, oder vielleicht sogar wegen dieses engen Bezugsrahmens ist ihr musikalischer Ton so einheitlich, dass es Mahler gelingt, in dieser Sammlung das menschliche Leben bemerkenswert intensiv heraufzubeschwören, das mit Einfühlsamkeit, Humor und Mitgefühl geschildert wird. Auf dem militärischen Gebiet ist klar, wo seine Sympathie liegt: seine Soldaten sind keine Helden, keine Weltänderer; sie gehören zum armen, blutbefleckten Fußvolk, dem Kanonenfutter (Revelge), den „kriegszitternden“ jungen Männern, die, pour encourager les autres, im Morgengrauen erschossen oder gehängt werden (Der Tamboursg’sell). Und seine Mädchen sind ihre Liebchen, die sie zum Abschied ihn ihr Bett nehmen, bevor sie sie an den Krieg verlieren (Wo die schönen Trompeten blasen), sie von ihrer Wache ablenken (Der Schildwache Nachtlied) oder sie wegen ihres arroganten Benehmens in ihrer feschen Uniforn necken (Trost im Unglück). Im Hintergrund dieser Rendezvous und Kabbeleien steht das Leben auf dem Lande mit seinen Schnittern und Mägden (Rheinlegendchen), seinen Dorftrotteln und Bauernmädchen (Verlorne Müh), seiner zermürbenden Armut (Das irdische Leben) und seinem volkstümlichen Humor voller hausbackener Weisheit (Lob des hohen Verstandes, Des Antonius von Padua Fischpredigt). Die vorliegende Einspielung beginnt mit einem der am spätesten komponierten und längsten Lieder der Sammlung. Revelge (1) ist ein grausiger Todesmarsch aus den Zeiten, als Truppen wie auf Parade in die Schlacht marschierten. Zum Rühren der Trommeln und Schmettern der Trompeten wird er vom Wecksignal am Morgen in den Aufruhr von Attacke und Gegenattacke gestürzt. Erst wenn jeder einzelne Mann niedergemäht ist, verlangsamt sich das Tempo und verwandelt den strammen Militärschritt in das trockene Ratteln der Gebeine der Toten, und gespenstische Fanfaren hallen aus der betroffenen Landschaft wider. Die letzte Seite, als der der tote Tambour und seine Kameraden noch einmal zur Parade aufstehen, besitzt katastrophische Wirkung. Lob des hohen Verstandes (2) ist im Gegensatz dazu eine der komischen Juwelen der Sammlung. In einem seiner füheren Wunderhorn-Lieder, Ablösung im Sommer, hatte Mahler humorvoll die Übertragung der Gesangsverpflichtungen beim Wechsel vom Frühling zum Sommer vom Kuckuck auf die Nachtigall beschrieben. In Lob des hohen Verstandes wetteifern die beiden Vogelsänger direkt miteinander, und das zwitschernde C-Dur soll bestimmt den Pomp einer Vogelvariante der Meistersinger andeuten. Akademische Skalen und trillernde Kadenzen, luftiges Piepsen der Vögel und das Bocken und Gebrüll des Esels, komische Wiederholungen („Ohren groß, Ohren groß“) und Pausen zum Räuspern tragen allesamt zum naiven Humor bei. Am Ende verkündet der Esel sein Urteil mit dem törichten Mangel an Selbstzweifel der wahrhaft Dummen. Rheinlegendchen (3) ist der lieblichste und entzückendste der vielen Ländler in den Wunderhorn-Lieder und kam bei seiner Uraufführung so gut an, dass das Publikum seine Wiederholung verlangte. Abgesehen von der unvermeidlichen Harmonisierung in Terzen und Sexten, schließen die Klavierzwischenspiele Elemente volksmusikalischer Fiedelimprovisation ein. Ein inspirierter Abstieg in die Subdominante, wenn der Ring des Schnitters in das Wasser des Rheins fällt, ist die anschaulichste in einer Anzahl überraschender Verschiebungen in diesem sonst scheinbar simplen Lied. Im Konzert werden die Wunderhorn-Lieder oft von zwei Sängern—einem Mann und einer Frau—aufgeführt, und die Sammlung enthält einige Dialoge, von denen Wo die schönen Trompeten blasen (5) nicht nur der berühmteste ist, sondern womöglich auch der emotionale Höhepunkt der ganzen Sammlung. Er hat einen direkten Vorgänger in Kriegers Ahnung, einem der fesselndsten Lieder aus Schuberts Schwanengesang. Entfernte Militärfanfaren und Trommelschläge setzen die Szene, in der ein Mädchen am Vorabend einer Schlacht von ihrem Geliebten—oder seinem Gespenst—besucht wird. Ob er schon tot ist oder eine Todesahnung für den nächsten Tag hat, ist nicht genau klar, aber wie auch immer—die verzückte Zärtlichkeit des Treffens und die unheilschwangere Atmosphäre sind im Kontrast zwischen dem militärisch strengen 2/4-Takt und dem träumerischen 3/4 in der Umarmung der Liebenden unverkennbar. Ein ähnlicher Konflikt zwischen Pflicht und privatem Gefühl ist das Thema zweier weiterer Dialoge, die hier Wo die schönen Trompeten blasen umrahmen; musikalisch wiederum durch den Kontrast von militärischem Zweiertakt mit verführerischem Dreiertakt gekennzeichnet. Im Lied des Verfolgten im Turm (4) hält ein politischer Gefangener mit dem Refrain „Die Gedanken sind frei“ seinen Mut gegenüber den eindringlichen Bitten seiner Geliebten aufrecht. Zuerst besteht zwischen seiner und ihrer Musik ein totaler Gegensatz, was andeutet, dass sie von den hohen Idealen, wegen denen er überhaupt ins Gefängnis gesteckt wurde, keine Ahnung hat. Aber je verzweifelter sie wird und je beharrlicher er, beginnen Elemente ihrer Klagen seine Musik anzustecken. Das Lied endet dennoch mit dem Refrain „Die Gedanken sind frei“. Noch eindringlicher ist die Atmosphäre in Der Schildwache Nachtlied (6). Hier steht ein Soldat Wache, der den Schmeicheleien einer verführerischen Frau widerstehen muss. Mit zunehmender Vehemenz (und sogar militärischem Bravado) verkündet er sein Pflichtbewusstsein, aber der Reiz ihrer Stimme klingt in seinen (und unseren Ohren) in den außerordentlichen Harmonien und Geweben nach, mit denen Mahler die Schlusstakte einkleidet. Das irdische Leben (7) besitzt eine Form, die in vielen Volksliedtraditionen typisch ist: eine Folge von Handlungen führen zu einem unvermeidbaren und gewöhnlich unwillkommenen Ende. In diesem Fall versucht eine Mutter ihr hungerndes Kind zu trösten. Dreimal versucht sie, es zu beruhigen—„morgen werden wir ernten/dreschen/backen“—aber am Ende ist es zu spät, um es zu retten. Mahler setzt die beiden Stimmen gegen ein unheimliches Moto perpetuo in es-Moll, das das Mahlen der Mühle des Schicksals andeutet. Die wiederholten Schreie des Kindes „Gib mir Brot“ umfassen sehr weite Intervalle, zuerst eine Oktave, dann eine Dezime—wie das offene Schnäbelchen eines jungen Vogels im Nest—während die Versuche der Mutter, das Kind zu beschwichtigen, tiefer liegen und sowohl Beklommenheit als auch Ohnmacht verraten. Im langen Zwischenspiel vor dem letzten Couplet kommt die Musik fast zum Stillstand, und ihr unbehagliches Stocken schildert uns den Ausgang schon bevor er uns ausdrücklich mitgeteilt wird. Des Antonius von Padua Fischpredigt (8), die Mahler später in das Scherzo seiner Symphonie Nr. 2 verarbeitete, ist das musikalische Gegenstück zu einer Szene auf einem deutschen Altarbild des Mittelalters. In dieser Erzählung geht der Heilige Antonius zum Fluss, um den Fischen zu predigen, da er von der Gleichgültigkeit seiner Gemeinde verdrossen ist. Der Witz (und die Moral) ist, dass sie, egal wie sehr ihnen die Predigt auch gefällt, von ihr genauso wenig reformiert werden wie ihre menschlichen Gegenstücke. Mahlers Vertonung besitzt einen wunderbaren Humor, der keine Miene verzieht: sein 3/8-Ostinato wimmelt von Fischen, die in schillernden Terzen durch die Tiefen des Klaviers tauchen und flitzen. Wenn das Gefallen der Fische ausgedrückt wird („Kein Predigt niemalen“) wird der zugrunde liegende Ländler zu einem echten Tanz, der mit nahezu Bergscher Polytonalität stolziert, während ein glatterer und noblerer F-Dur-Abschnitt bei „Gut Aale und Hausen“ perfekt Unterschiede im Status ausdrückt. Am Ende werden jedoch alle Illusionen zerstört; die letzte Strophe wird von einem c-Moll-Orgelpunkt untermauert, und die Szene löst sich in einer absteigenden chromatischen Passage auf, die dem Ende von Das ist ein Flöten und Geigen aus Schumanns Dichterliebe erstaunlich ähnlich ist. Wer hat dies Liedlein erdacht? (9) ist wiederum ein Moto perpetuo im 38-Takt, dessen jodelnde Sechzehntel sich offensichtlich von seinem alpenländischen Kontext ableiten („Dort oben am Berg …“). Es it offensichtlich nicht ernst gemeint, der Pseudopathos des Mittelteils („Mein Herzle ist wund“) wird von Schubertischen Tonartenverschiebungen nach G-Dur und Ces-Dur unterstrichen, während die letzte Seite in der Zeile „Und wer das Liedlein nicht singen kann“ durch ein nicht weniger als sieben Mal hintereinander gesungenes hohes Es belebt wird. Es folgen zwei komische Dialoge: Trost im Unglück (10) ist ein wilder Austausch zwischen einem Husar und seiner Geliebten. Sie verkünden beide laut ihre Selbständigkeit (sie macht sich über seinen kurzen Steckenpferd-Galopp mit ihrem eigenen, gleichmäßiger entlangtrabenden Rhythmus lustig) und galoppieren in entgegengesetzte Richtungen davon—aber man vermutet, dass sie sich am nächsten Tag für eine neue Runde treffen. Verlorne Müh (11) ist ein weniger ausgeglichener Wetteifer. Hier ist die Musik eine ausgesprochene Karikatur: die einschmeichelnden Ländlerrhythmen und rührseligen Vorschläge des Mädchens werden zusehends extremer, die Abweisungen des Jungen immer herrischer. Etwas weniger ätzend, und das Lied könnte aus der Feder von Johann Strauss stammen. Der Komponist von Der Tamboursg’sell (12) ist jedoch unverkennbar. Wie sein Gegenstück Revelge ist das Lied wesentlich größer angelegt als die anderen Stücke und im gleichen Maße vom Trauermarsch der fünften Symphonie, dem es sehr ähnlich ist, inspiriert wie es Anregung für ihn bot. Wie wir bereits wissen, wurde es auch einige Jahre später komponiert als die übrigen Wunderhorn-Lieder; zu einer Zeit, als Mahler sich dem anderen großen literarischen Einfluss auf seine Komposition näherte: Friedrich Rückert. Den ganzen ersten Teil hindurch ist die Struktur unerbittlich karg und trostlos, und besteht aus wenig mehr als einem Ächzen wie einer Totenklage und dem Murmeln der Trommeln. Aber das folgende Zwischenspiel lässt eine eine ganz unerwartete und tief bewegende Melodie erwachsen, als der unglückselige Tambour von der Welt Abschied nimmt. Solch ein abschiednehmendes Klagelied ist natürlich in Mahlers Liedern nicht ohne Vorbild—das letzte der Lieder eines fahrenden Gesellen ist zum Beispiel ein solcher Trauermarsch, und das frühe Lied Zu Straßburg auf der Schanz erzählt ebenfalls von einem jungen Soldaten, der zum Hängen verurteilt wurde. Aber diese Passage hat in der Entwicklung von Mahlers Kompositionsstil größere Signifikanz. Wie der Mahler-Forscher Donald Mitchell scharfsinnig bemerkte, weist die über einem schlichten Bass von Tonika–Dominante lang ausgedehnte Melodie mit ihrer kanonischen zweiten Stimme, mehr als nur eine flüchtige Ähnlichkeit mit einer Passage aus dem ersten der Kindertotenlieder, Nun will die Sonn’ so hell aufgehn auf. Diesem Lied, das genau am Wendepunkt von Mahlers Übergang vom Wunderhorn- zum Rückert-Stil steht, gelingt es, Elemente aus beiden zu vereinen. Es war Mahlers eigener Abschied von der Welt in Des Knaben Wunderhorn. Urlicht (13), das als Coda zu dieser Einspielung fungiert, ist das am frappierendste spirituelle Lied der Sammlung. Es wurde ein Jahr nach seiner Komposition als vierter Satz der zweiten Symphonie wiederverwertet und trügt in seiner Schlichtheit. Der außerordentliche heitere Frieden des choralhaften Abschnitts zum Beispiel wechselt ständig im Metrum, was die Phrasen unterstreicht und Pausen zum Sinnieren erlaubt. Sowohl die irdische Not als auch die himmlische Seligkeit werden mit anschaulicher Ökonomie gezeichnet; der „breite Weg“ des Sängers wird in der Art von Ich ging mit Lust durch Vogelgezwitscher gewiesen—eine Vision des Himmels als Naturparadies—während die leidenschaftlichen Tremolandos und sehnsuchtsvollen Intervalle des Höhepunkts ein Musikstück, das nur fünf Minuten währt, in eine ganze Abhandlung über die conditio humana ausweitet. Nichts könnte die ausschlaggebende Bedeutung der Wunderhorn-Welt für Mahlers—musikalische, emotionale und spirituelle—Vision besser illustrieren.